The Saints have had a relatively quiet offseason ever since their season ended in devastating fashion in the NFC Championship game. That’s about to change though, as they have several big decisions to make in the coming days and weeks. Mark Ingram is set to be a free agent, and there’s been a lot of talk that the Saints might move on and choose to give Alvin Kamara more of a featured role. Ingram “wants nothing more than to strike a deal to stay in New Orleans,” writes Larry Holder of The Athletic. Holder also writes that head coach Sean Payton wants to keep him around. Holder points out that Ingram doesn’t have the typical wear and tear a 30-year-old running back usually has, because he’s usually split time in whatever backfield the Saints have put together throughout his career. The Saints also lacked consistent options in the passing game beyond Michael Thomas last year, and could be looking to add a receiver. Sources told Holder that “Someone like Adam Humphries intrigues the Saints.” Holder thinks Humphries might get priced out of their range though, and that New Orleans might end up turning to the draft to add receiver help. Multiple sources also told Holder the Saints aren’t interested in adding Antonio Brown. There’s been a ton of discussion about the Giants’ quarterback situation, but not a lot has been written about Kyle Lauletta. 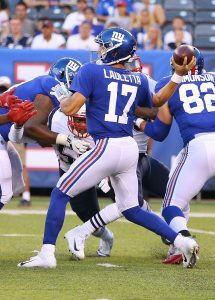 Lauletta was the Giants’ highly-touted fourth round pick last year, but was relegated to third-string duties behind Manning and Alex Tanney for much of the season. 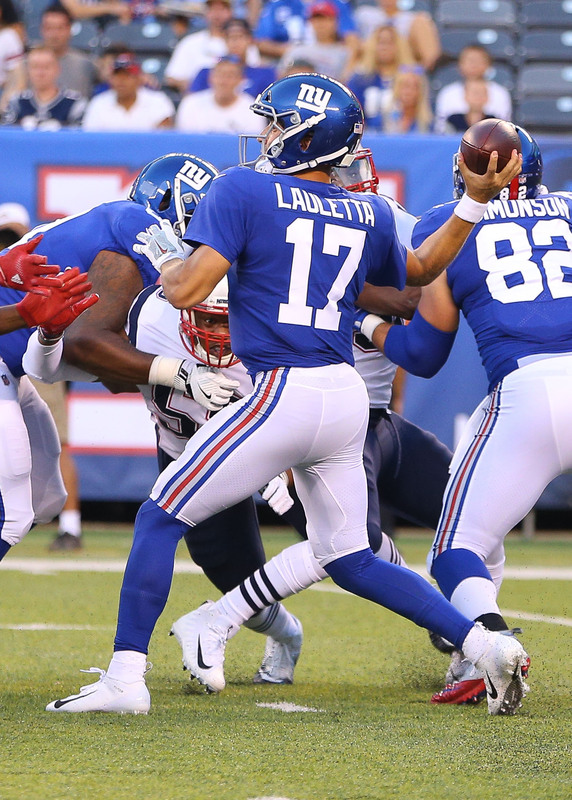 The Giants re-signed Tanney earlier today, which could bode poorly for Lauletta. Lauletta also underwent knee surgery this offseason, sources told Ryan Dunleavy of NJ.com. Dunleavy isn’t bullish on Lauletta’s future with the team, and writes that he’s already shown he isn’t “capable of challenging Manning.” Lauletta only attempted five passes this past year, completing zero and throwing an interception. With the Giants a definitely possibility to draft a quarterback high in this April’s draft, Lauletta could prove to be a one-and-done in the Big Apple. The Eagles extended guard Isaac Seumalo earlier today, and they might not be done locking up offensive linemen. The “expectation” is that Philly “will attempt to extend OL Halapoulivaati Vaitai this offseason”, according to Jeff McLane of the Philadelphia Inquirer (Twitter link). Vaitai was the Eagles’ fifth round pick in 2016, and has been a backup tackle for them ever since. In 2017, he filled in for Jason Peters at left tackle and started the entire second half of the season plus the playoffs. Peters is 37 now, and his status for 2019 is still unclear. It’s very possible that the Eagles view Vaitai as the successor to Peters on Carson Wentz‘s blindside. “When the 2018 season ended there was an expectation that Sean Lee would not return to Dallas,” writes Calvin Watkins of The Athletic. But now things appear to be shifting in the direction of the veteran linebacker returning for one more season in a reduced role, Watkins notes. Lee wants to play again and is willing to accept less playing time, according to Watkins, and Cowboys EVP Stephen Jones sounded open to the idea of bringing him back. “When he has played, he has played really well. He’s had a big impact on our football team, not only what he’s doing on the field, but off the field with his leadership,” Jones said. In the same piece, Watkins also took a look at the looming contract negotiations between Dallas and Ezekiel Elliott. Watkins thinks that Elliott “will probably get at least $50 million guaranteed”, topping the $45MM guaranteed Todd Gurley received from the Rams. We learned earlier today that Eli Manning is increasingly likely to remain with the Giants in 2019, and the fact that New York does not presently have a legitimate replacement on its roster is a big reason for that. Indeed, although the team selected Kyle Lauletta in the 2018 draft and repeatedly indicated it wanted to give him some game action this year, Lauletta’s first appearance in a regular season NFL game — during garbage time in last week’s blowout win over the Redskins — did not go well. Lauletta has now been demoted to the team’s No. 3 QB, where he spent most of the season, and he is inactive for the club’s game today. As Ryan Dunleavy of NJ.com suggests, that move speaks volumes about where Lauletta is in his development. Cowboys linebacker Sean Lee is active today for the first time since November 5 and will play a reserve role behind rookie phenomenon Leighton Vander Esch, per Todd Archer of ESPN.com (via Twitter). Lee still provides value when healthy, but Jane Slater of the NFL Network tweets that Lee told the team he did not want to start and interfere with Vander Esch’s progress. It remains to be seen how Lee will be deployed moving forward. At the beginning of this month, Ian Rapoport of the NFL Network said the Cardinals were going to reassess their front office and coaching staff at the end of the season, and Jason La Canfora of CBS Sports reaffirms that report today. JLC writes that Arizona is mulling sweeping changes, and some sources say it would be a “major surprise” if first-year head coach Steve Wilks keeps his job. The bigger question, according to those sources, is whether GM Steve Keim is retained, but if he is not, he is a strong candidate to join the Raiders‘ front office. The Buccaneers are expected to move on from head coach Dirk Koetter at the end of the season, but La Canfora writes that Koetter is still highly-respected as an offensive coordinator and plenty of teams with OC vacancies this offseason will be pursuing him to fill that role. Koetter’s own OC in Tampa, Todd Monken, will also be a highly-coveted offensive coordinator candidate in 2019 assuming the Bucs cut ties with him. The Eagles remain committed to Carson Wentz, and Nick Foles is expected to hit free agency in 2019. Jay Gruden‘s future with the Redskins is uncertain, but Alex Smith is out of the hospital and there is optimism that he will be able to resume his playing career. It’s been a rough year for the Jaguars. After making the AFC Championship game last year, they were supposed to be contenders again in 2018 but nothing has gone according to plan. They were just 3-8 entering today, and benched Blake Bortles for Cody Kessler while firing their offensive coordinator. While they squeaked out a 6-0 victory over the Colts, major changes are still coming this offseason, according to Jason La Canfora of CBS Sports. La Canfora says that “sweeping changes are inevitable, which may include coaching and front-office moves”, and cites “multiple NFL salary cap executives” who say the team will need to “gut its roster” because of their cap situation. Jacksonville has spent big on free agents the past couple of years to build the team, but La Canfora writes their win-now window is “now effectively closed”, and they’ll have to start dumping the high-priced veterans soon. La Canfora seems to think head coach Doug Marrone‘s job is in danger, and notes that team president Tom Coughlin could “consider a return to the sidelines” to lead the team. Whatever happens, the Jaguars will be one of the most interesting teams to monitor this offseason. Ravens coach John Harbaugh may have saved his own job with the team’s recent three game winning streak, but he could be losing one of his assistants soon. Baltimore’s defensive line coach Joe Cullen interviewed for the head coaching job at UMass, and is considered a “top candidate” for the position, according to Ian Rapoport of NFL Network (Twitter link). Cullen played at UMass in the 80’s, and was an assistant coach there in the early 90’s. He’s coordinated at Indiana and Richmond, but has always been a defensive line coach at the NFL level. 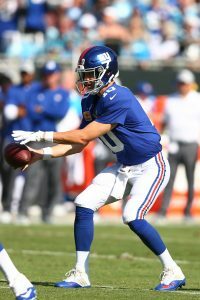 Although Eli Manning has played a lot better recently and the Giants have now won three of four games, the team still plans to get rookie quarterback Kyle Lauletta in a game at some point, according to Ralph Vacchiano of SNY (Twitter link). Vacchiano notes that it may only come in the second half of a blowout game and not a start, but that the team wants to get a look at him either way. It’s been speculated that a team might claim Kareem Hunt off waivers in order to get him on his cheap rookie contract that has him locked up through 2020, but “multiple executives” told Adam Schefter of ESPN.com that Hunt is likely to go unclaimed on waivers. While one GM told Schefter there’s “no chance” he gets claimed, it still wouldn’t be a shock if he does. While he’s likely facing a lengthy suspension, Reuben Foster is also facing a lengthy suspension and got claimed even though he’s making significantly more money than Hunt. Last season became somewhat of a missed opportunity for the Giants. Davis Webb did not see any action, and the team moved no closer to a post-Eli Manning future. With Webb now off the team, and the Giants bypassing the 2018 first-round quarterback contingent, the focus may be shifting to the next mid-round backup. The Giants are planning to give Kyle Lauletta game work at points down the stretch, Ralph Vacchiano of SNY.tv reports. They don’t want to make a similar mistake like they did in 2017, especially with Manning possibly in his final games as a Giant. This plan, however, will be contingent on the Giants’ standing in an increasingly muddied NFC East. After two straight wins, the Giants are 3-7 and three games behind the now-Colt McCoy-led Redskins. The Giants do not plan to bench Manning until the playoffs are out of the question, Vacchiano adds. The 37-year-old quarterback has played well against the 49ers and Buccaneers and will face a battered Eagles secondary this week. But the team would like to see what it has in Lauletta, a fourth-round rookie out of Division I-FCS Richmond, despite his legal issues. The Giants would, if possible, like to see third-stringer Alex Tanney on the field as well, per Vacchiano, though that might be a tough ask. One plan for Lauletta would hinge on the Giants either leading by a big margin or losing by one — similar to how an MLB team would use a mop-up reliever — to allow for a second-half switch, Vacchiano notes. Last year, New York benched Manning for Geno Smith, snapping his historic start streak to cost both Jerry Reese and Ben McAdoo their jobs. Pat Shurmur, however, seems to like Lauletta’s prospects, per Vacchiano. So, if/when the Giants fall out of remote contention, some potentially awkward Lauletta substitution sequences may occur as the franchise explores how it will go about replacing Manning. Manning is under contract through 2019 and has a no-trade clause in his deal, but with the Giants looking readier to rebuild, he may well be off the roster next year. Sunday, 09:47am: After learning more about this situation, the Giants are fully supporting Lauletta, per Jason La Canfora of CBS Sports. La Canfora writes that there was a major backup on Lauletta’s route to the team facility on the day of his arrest, and, scrambling to be there by 8:30am, he disobeyed a police officer on the scene who wanted him to take a lengthy detour. Lauletta concedes that he should have obeyed the directive immediately, but sources say the QB did not act belligerently and he says he never came close to hitting the officer or anyone else. He intends to vigorously fight the criminal charges, and the Giants, who believe Lauletta was honest with them about the situation, still think highly of him. As such, JLC says Big Blue is still considering pulling Manning in favor of Lauletta, and while Lauletta’s arrest may have altered that timeline a bit, the expectation is that he will be under center at some point this season. 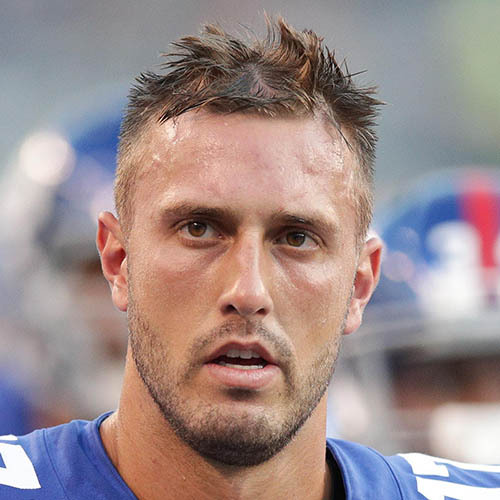 Thursday, 12:42pm: Giants quarterback Kyle Lauletta is facing multiple charges after his run-in with cops on Tuesday morning. The Weehawken (NJ) Police Department announced that Lauletta has been charged with eluding police, obstructing administration of law, and resisting arrest. He’s also facing motor vehicle charges for reckless driving, disregarding an officer’s directions, an improper turn in marked traffic lane, and failure to remain in a marked lane. The rookie QB was cuffed on his way to practice this week when he failed to obey the directions of an officer and nearly struck police with his car. It was a disappointing incident for the fourth-round pick, particularly since the Giants could be inches away from yanking Eli Manning in favor of other options. In a radio interview, head coach Pat Shurmur was non-committal when asked about a potential suspension for the youngster. But, at minimum, a fine from the club seems likely and the arrest may delay his opportunity to start in place of Manning. The lowly 1-7 Giants are on their bye this week. They’ll resume action on Monday Nov. 12 when they face the 49ers. Giants quarterback Kyle Lauletta was arrested this morning for an incident that occurred while he driving to the team’s practice facility, Ryan Dunleavy of NJ.com (on Twitter) hears.Dunleavy hears that Lauletta nearly struck police with car when he failed to obey the directions of an officer. The fourth-round pick has yet to see a snap this year, but there has been talk of him seeing the field as Eli Manning continues to struggle. The Giants, who have a Week 9 bye, are 1-7. Their next game will be in primetime on Monday Nov. 12 against the 49ers. The Giants still have four quarterbacks after trimming their roster to 53 players yesterday, but the team will obviously not go into Week 1 with four signal-callers. As Ryan Dunleavy of NJ.com reports, Big Blue is open to dealing either Davis Webb or Kyle Lauletta. The Giants selected Webb in the third round of the 2017 draft, but new head coach Pat Shurmur and new GM Dave Gettleman do not have any ties to the California product. They do have ties to Lauletta, who was selected in the fourth round of this year’s draft, so it would certainly be surprising if they chose to trade the former Richmond QB. Nonetheless, it was Lauletta, and not Webb, who played in the team’s final preseason game, so the Giants could have been preserving Webb as a trade chip, they could have been showcasing Lauletta to bolster his trade value, or both. If New York is able to find a taker for either young QB, 30-year-old Alex Tanney would likely remain as the team’s No. 3 QB, as Shurmur prefers to keep three quarterbacks on his roster. Of course the Giants could elect to keep both Webb and Lauletta and continue to groom them for the future while cutting Tanney in favor of a player at a position of need like cornerback or defensive line. The Aaron Donald saga may finally be nearing a conclusion. Rams GM Les Snead indicated earlier this week that team and player were progressing towards a new deal, and head coach Sean McVay echoed those sentiments last night. Per Vincent Bonsignore of The Athletic (Twitter link), McVay said, “there’s increased dialogue. There’s more…we feel positive about the direction that these things are going. I think there’s a level of urgency that’s being displayed from us.” That probably sounds like music to the ears of Rams fans, who have legitimate championship dreams this season. Ryan Dunleavy of NJ.com tweets that Giants quarterback Kyle Lauletta is getting reps with the second team today, which is the first time Dunleavy can recall that happening. 2017 third-rounder Davis Webb was said to have a big lead on Lauletta for Big Blue’s backup job coming out of minicamp, but this could be a sign that Lauletta, a 2018 fourth-round pick, is closing the gap. Webb, of course, was selected by New York’s prior regime, while Lauletta has the benefit of being chosen by the team’s new crop of decision-makers. Ian Rapoport of NFL.com reports (via Twitter) that Cardinals LB Jeremy Cash sustained a knee injury during last night’s preseason game that is believed to be season-ending. That is a tough blow for the Duke product, who has bounced around a few different teams since entering the league but who had a real chance of cracking Arizona’s 53-man roster this season. The Cardinals claimed him off waivers in March. Good news for 49ers fans, as right guard Joshua Garnett has returned to practice after missing two weeks to deal with his right knee issue, per Cam Inman of the Bay Area News Group (via Twitter). Matt Barrows of The Athletic tweets that Garnett’s primary competitor for San Francisco’s right guard job, Jonathan Cooper, is also on hand, so perhaps the competition can finally begin in earnest. This comes just a week after a report that the 49ers were growing increasingly concerned about Garnett’s knee problems. Dave Birkett of the Detroit Free Press offers his take on the prospects of a few different Lions after the team’s first preseason game several nights ago. He says it is only a matter of time before rookie Kerryon Johnson becomes Detroit’s starting tailback, though Ameer Abdullah also looked good and was the first man up on kick and punt returns. Birkett adds that Jake Rudock‘s rough night, combined with Matt Cassel‘s ties to head coach Matt Patricia, have increased Cassel’s chances of opening the season as the club’s backup QB. The Bears signed running back/return specialist Knile Davis earlier today. The next several weeks could be crucial in the Giants/Odell Beckham Jr. relationship. The superstar wideout said he intends to show up to camp on time, but this may not be a full-on pledge. Instead, it could be contingent on how extension talks — currently not going well — proceed. In an expansive piece attempting to gauge this situation, ESPN.com’s Bill Barnwell writes the presence of Dave Gettleman could make a significant difference in this process. Famously known as a hard-line negotiator, alienating Steve Smith and rescinding Josh Norman‘s franchise tag in Carolina, Gettleman has repeatedly said he wants the Giants to be geared around their ground game more than they have been in the past. He authorized the highest running back draft pick since Reggie Bush and could have four new starting offensive linemen come Week 1. Barnwell suggests the Giants could use this season to see how Saquon Barkley impacts their offense rather than authorizing a wide receiver-record contract for Beckham before the season. This strategy certainly wouldn’t go over well with Beckham, and it could run the risk of a lengthy holdout, but the Giants would also have the franchise tag as a short-term option in 2019. Here’s the latest on Big Blue coming out of minicamp. While Barkley and second-round pick Will Hernandez have moved into the Giants’ starting lineup, third-round pick B.J. Hill may be ready to join them. The rookie lined up alongside Damon Harrison and Dalvin Tomlinson in the Giants’ new 3-4 scheme at minicamp, according to Dan Duggan of The Athletic (subscription required). The Giants don’t have a surefire competitor that would deprive the N.C. State-developed rookie of a viable path to a Week 1 start, so this will be an interesting situation once training camp begins. Another surprise starter could come in New York’s secondary. The Giants are preparing to give Eli Apple another chance at cornerback opposite Janoris Jenkins and aren’t as talented at this spot as they were with Dominique Rodgers-Cromartie also in the picture last season, but Duggan writes Landon Collins could have an interesting sidekick as well. Low-level UFA addition (and converted corner) Curtis Riley has a legitimate shot to start alongside Collins, per Duggan, after working extensively with the first unit in the offseason. Darian Thompson and Michael Thomas are among the others vying for that job with Riley, who played 11 games (no starts) with the Titans the past two seasons after entering the league as a UDFA in 2016.